So my last entry was a little sappy. Sorry for that. I guess I was still on an endorphin high from our morning excursion of do-goodness. Don't worry, though. That ended in like five seconds flat. Our cleaning people were here this morning. Oh, how I love coming home to a perfectly clean home. We came upstairs so I could put Little E down for his nap. 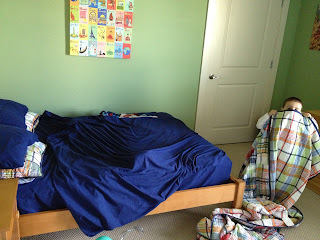 As I was changing Little E's diaper, Big E took it upon himself to completely unmake his freshly made bed and drag all of his sheets, pillows, and blankets under his bed. Five hundred curse words consecutively ran through my head, although I rattled off none of them aloud. At first, he stonewalled me. Oh, I know. Because you want to drive your dear, sweet mother insane. I went downstairs for a minute to grab a drink (non-alcholic, of course) and cool off. I was feeling so frustrated. He was doing a monster check. Hmmm, maybe we need to take it easy on the monster thing. I asked him to remake his bed, which turned into an hour exercise for him. One hour closer to bedtime, that's all I have to say.